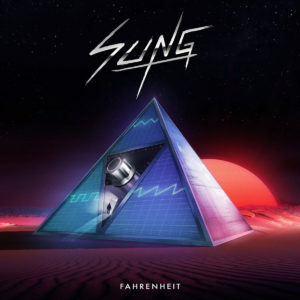 Get some water and some ice, because Sung just dropped his new album “Fahrenheit”, and it is already one of the hottest albums of the year. After we were lucky enough to see one of his amazing live performances in Amsterdam just a few weeks ago, we already knew that this guy was bound to deliver something amazing and he sure did not disappoint us. While many artists excel in one style, be it the darker harsh beats with a strong bass line, dreamy ballads, or upbeat funky dance tracks, Sung shows us that he can do it all. The musical mood of the album changes so frequently that every song made us feel something different; and we loved it. We start our journey on a high note: the opener “City Stars” immediately pulls you in and gets you moving. It is definitely the most danceable track on the album and we can’t wait to hear it in a club setting. The atmosphere shifts promptly as we move to the second track. “Cobalt Vision” takes us to a gloomy cyberpunk setting with a pressing baseline and distorted beats. From there, we move on to “Starlight Paradise”, a warm and dreamy place, where you can feel the sunset on your skin, underlined by atmospheric but upbeat synths. “Afterlife Club” is the second track on the album that we are sure will sound even better on the dancefloor. While less melodic than the opener, the rhythm is still irresistible, especially with the beautiful depth it transports. The next track, “Bayshore Route” could become a contender for our favorite cruising tune. Driving beats, mellow guitars and melodic synths make this one for driving into the sunset – but at high speed. The following “Silver Light” gets you back down, with a beautifully dreamy melody that one can’t help but get lost in. We stay in that state with the hypnotizing trancey “Up Hill”. With “Leap of Faith” and “ignition” we find two solid, classical synthwave songs, with the more upbeat “Ingition” having the potential to become another dancefloor favorite. “Life and Glory” taps into the 80s soundtrack sound, making it easy to like and on top super catchy. With “One Way” the album ends in wonderful melancholia, leaving you satisfied and wondering what will be next. We certainly hope that Sung retains the incredible versatility of “Fahrenheit” on his future endeavors. While some tracks are not quite as memorable as others, this overall is simply a piece of supreme synthwave music.